Both of these young women showed extraordinary courage in coming forward about the abuse they endured while training to be a part of the world’s elite in their sport. But why is it only now, years after the fact, that we hear Denhollander’s story? Like many others, Denhollander’s case was dismissed, swept under the rug by an organization that is supposed to provide shelter and support for its followers. After more than 150 survivors from the USA Gymnastics program have come out, Denhollander will receive some justice through the court system. The church, however, refuses to acknowledge the gravity of the acts committed against her, instead choosing to respond as though these were somehow indirect acts of Gods’ will. Now that her story is being told, Denhollander is speaking out about the way her church failed to act. Hers is not the only case, either, where Christian values have been misappropriated to suggest that somehow, abuse victims have suffered no crime, or worse, have been chosen by God for abuse. However, in cases such as those of the young women Moore was allegedly involved with, there is no accountability for figures like Moore — specifically, white males who have taken on leadership roles in the community. Instead, it is suggested that their actions should be dismissed as one forgives a sin. There is absolutely no excuse for sexual abuse. Period. But especially when that abuse involves a minor, how can evangelicals sit by and try to claim that this is wholesome? That this is something that some almighty God would have intended to enact upon innocent youths? 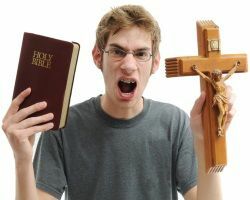 Evangelical extremist and radio host Kevin Swanson is a good example of the kind of behavior the Christian church should want to stamp out. On one broadcast, Swanson tried to suggest that the reason for Nassar’s abuse was the immodest nature of gymnastics. “Do you really want your daughters involved in a sport that involves a fair amount of immodesty in which red-blooded American male coaches are interacting with these girls? Or, worse yet, where the infatuation of the body eventually effects the lesbian coaches?” Swanson asks. Larry Nassar might not have the political following that Roy Moore does, but it’s the same refusal to accept these acts as wrong. The church is endorsing a policy of patriarchy that assumes it’s nearly impossible for these men to do any wrong, and that’s frightening. Swanson’s statement managed to blame the victims and gay-bash at the same time. These aren’t modern Christian values we see on display here. Plenty of good-natured Christians have stood up for the young women of USA Gymnastics and condemned the acts of Roy Moore and those like him — and we have a pope who is pro-LGBT. But the remnants of a bygone era will not leave the church without a fight. Just like the bigots and misogynists who occupy far too many positions in our nation’s government, old-school evangelicals clinging to an antiquated system are hoping that if they stomp their feet enough, they’ll get their way. Let’s put them on notice that what they’re doing is neither right nor Christian. Why Are Christians Using Natural Disasters to Bible-Push?